Bharat Sanchar Nigam Limited (BSNL) has announced Promotional offer under 3G Data Services. 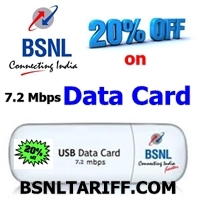 The BSNL has launched a special discount scheme upto 20% on the sale price of 7.2 Mbps 3G USB type HSDPA Data cards of Rs.2000 (Exclusive of VAT) was offered as a promotional measure for 90 days as a goodwill gesture. BSNL earlier also launched this 20% Discount offer on sale price of 3.6 Mbps 3G USB type HSDPA Data cards on occasion of festival season. A good response is received from various units and Telecom Circles which was offered as promotional scheme and ended up. Now, BSNL Competent Authority has re-launched the above promotional offer for a limited period on occasion of upcoming festivals like Makara Sankranthi, Republic Day, etc. The above offer will be implemented and with effect from 14-01-2013 and available upto 31-03-2013.